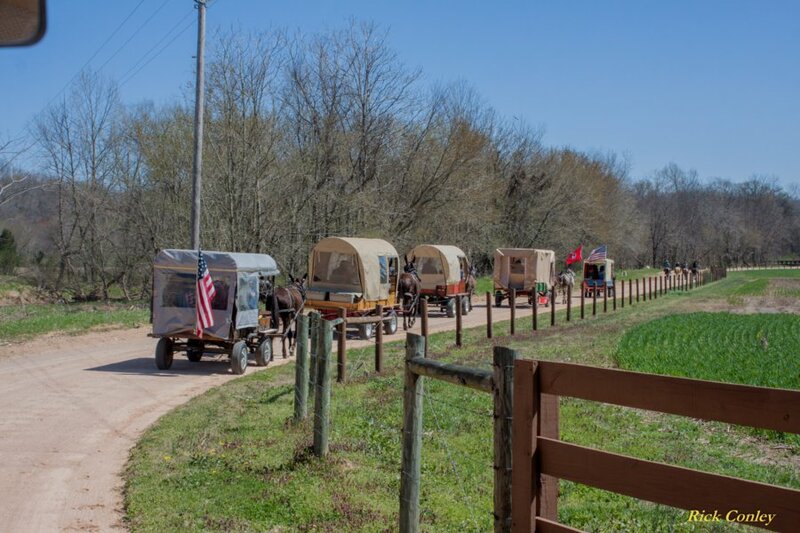 This year's Mule Day wagon train departed Decaturville, Tn. on March 29th for the approximately 125 mile easterly trek over to Columbia, Tennessee for the Columbia Mule Day celebration. (Note: This is a private group and NOT the "official" Mule Day wagon train!) Although, we had from 14 to 17 wagons and between 15 and 25 outriders each day, we had minimal equipment or tack problems all week. As usual, there were participants from several states, including Alabama, Indiana, Kansas, Missouri and, of course, Tennessee. We were blessed with only a small amount of rain this year and that was early in the week and did little to dampen anyone's enthusiasm. Although we had several cloudy, overcast days, we didn't have the need to pull our rigs out of any muddy fields like we did in some prior years. We also had very nice temperatures all week with highs in the mid to upper 70's (F). Overall, we couldn't have done much better as far as the weather was concerned and we arrived in Columbia on Thursday afternoon, April 4th, right on schedule. The overcast conditions all week did present some challenging conditions for your photographer, but I think that I was able to get some good photos of all that was happening. I have broken the photos up into 6 groupings, each covering a few days. Four of the groups cover the actual wagon train and the other groups are photos taken once the group reached Columbia. One includes friends from the wagon train, activities on the grounds, photos from a few of the various competitions, along with photos taken in the Mule Day Parade. The final group only includes photos taken on Friday afternoon during the Hitch Wagon Show. I hope you enjoy viewing the photos as much as I enjoyed taking them! Click the links below to see photos from this event! A DVD with a slideshow of all of the photos shown here is available for $41 plus $4 for shipping. A calendar with selected photos from the wagon train is available for $26 plus $4 for shipping. Individual photos are also available for purchase! Contact us or click here for more information about ordering.